Biology in Science Fiction: OMNI Magazine free! More than 200 scanned issues of OMNI magazine, originally published between 1978 and 1995, are now available for download at the Internet Archive. Totally free and presumably legal! (can you tell I'm excited?) While the science may be looking a bit dated now - and some of the UFO and "fringe" science was never very plausible to begin with - the short science fiction was and is fantastic. 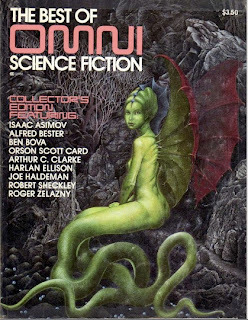 I had a subscription to OMNI through high school and college, and up until that point most of my SF reading had been much older stories, like the Heinlein juveniles and the old Asimov robot stories. Maybe William Gibson's "Johnny Mnemonic" and "Burning Chrome" don't seem cutting edge today, but 30 years ago they weren't like any science fiction I'd previously read. If you are looking for someplace to start, I'd suggest Best of OMNI Science Fiction #1 (1980). It includes GRR Martin's "Sandkings", Orson Scott Card's "Unaccompanied Sonata", plus stories by Isaac Asimov, Alfred Bester, Harlan Ellison, Robert Sheckley, Ben Bova, Roger Zelazny, Joe Haldeman and more. Check out the fan-created Complete OMNI Index to find your favorites. Image: Pierre Lacombe's cover of Best of OMNI #1.